It’s incredible that this was the first visit for us to the Star and Garter, being based on Manchester and visiting the rest of the venues, the Star and Garter seemed to have passed us by, missing this years Badgerfest due to clashes. Tonight, it played host to The Raven Age’s debut headline tour of Darkness Will Rise and some lucky bunch were already taking advantage of the meet and greet with the boys. Supporting the quintet was the promising In Search of Sun who were promoting their new release of Virgin Funk Mother being released via Spinefarm Records; the crowd were excited and with the Raven Age boys flitting in and out of the venue as they queued meant plenty of opportunities for selfies. Inside the venue, the boys continued their dazed awe of the fandom they were receiving by signing t-shirts and skin… tattoos in the making anyone? As the set-up is sorted, there were some great shenanigans being made by In Search of Sun (7); it tells you so much about a band when they start singing and dancing to Limp Bizkit’s My Generation. They looked relaxed and ready for the show, having fun with the crowd, finding space for each other on the cramped stage before smashing into their opening The World is Yours to a rapturous applause; the alternative rock meets funk sound wrapped its arms around the small venue and smothered it in a warm embrace; through no fault of their own however, the sound struggled at the beginning meaning they didn’t quite hit the tone they wanted, credit has to be given to the sound tech as it was sorted fairly quickly which meant that the true sound of In Search of Sun truly came out and it shone brightly. Like Jamiroquai being ravaged by a pit bull then shoved in an industrial grinder for good measure, the songs came thick and fast and at full throttle; introducing some of their older material, such as their opener, they blended it well with their latest material. The big hitters of Say it Like You See it, their latest video, were welcomed by the gathering crown. If they were searching for sun, they certainly received the warmth of the Manchester scene, the throng were scintillating as they moved and cheered and screamed their delight at the quintet. 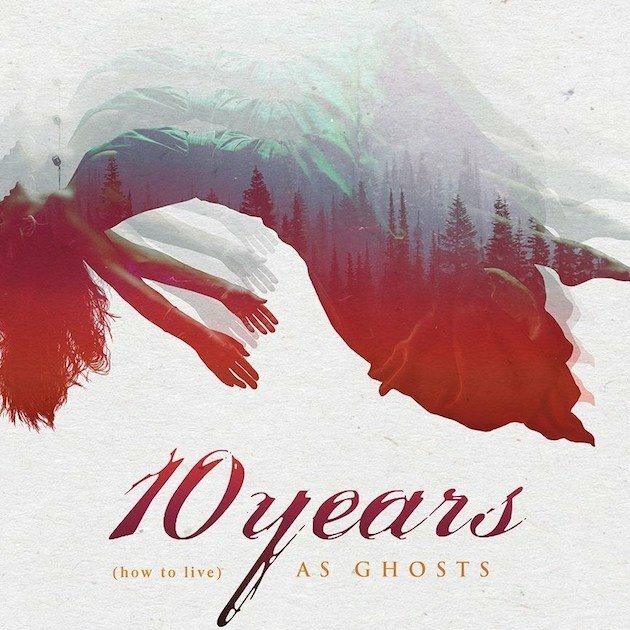 When they got going, they were magical; it’s not surprising they are being touted as one of the most promising bands coming out of the woodwork of the UK scene. that sets them apart from the quagmire. 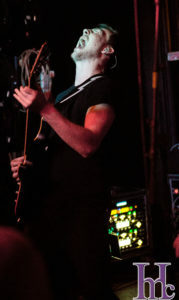 Feeding off an electrifying crowd, In Search of Sun were on cloud 9; the finale Bad Girl saw vocalist Adam Leader prompt the crowd to go to the knees ready to jump up and go wild with the chorus scream. This was a solid set that could have been something special if not for the unfortunate issues of sound at the beginning; not to fault the London boys, they were impressive when they got going and a definite must see for any rock fan. The crowd was warmed up very nicely indeed, showing respect to the bands as they lugged their gear on an off the stage through them as the door was to the left of the stage opening up onto the dance floor. That’s not to say they weren’t swamped by the merch stands at the back to the room, where the fans viewed it as fair game; damned right they should too. The Raven Age (9) took to the small stage, engulfing it with their presence and gear; much like In Search of Sun before them, it was cramped up there. Michael look to his left, then right, turned his back on us with the rest of the band; it was time. 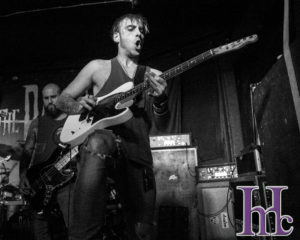 Hitting open with the melodic and haunting Darkness Will Rise intro just to make the hairs on your back stand on end, they spun around as Promise Land smacked you in the face with its roaring power of twin guitar riffs soaked up by the brutal bass lines and percussion. 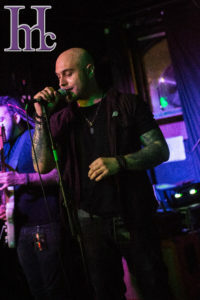 Michael Burrough was on form as his vocals soared perfectly above the parapet of the crowd to the back of the room with ease, it was clean and fluid, and the combination of the vocal trio during the chorus was incredible. The riffs were ferocious, ripping at us like an unkindness of ravens; new man Tony Maue was the perfect fit for the quintet, his enthusiasm was infectious as he shredded way by the side of Michael and Matt Cox. The crowd was on song too, blasting out lyrics word for word throughout, chanting “Raven Age, Raven Age, Raven Age” at every possible moment. 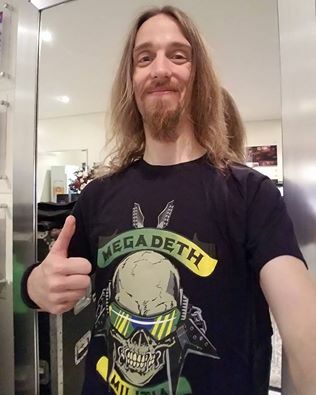 quintet; from The Merciful One to Salem’s Fate, it was all about the energy being built from Tony’s fury on guitar to George Harris’s front of stage antics that combined into a triple threat when Tony and Matt joined him. 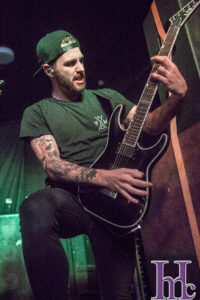 Of course Raven Age would not be them without the banter of Michael and his ability to not read his own set list, replying to the crowds humorous jeers with a jestful “f**k you” and a beaming smile on his face. 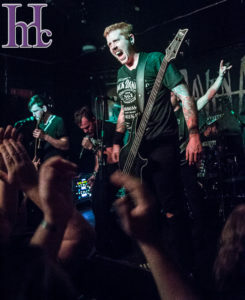 Jai Patel was in electrifying form as the thunderous percussions reigned supreme; Matt Cox was a monster on bass, strumming away with the fury of a daemon with Death March and the fan favourite Uprising tearing out. Of course, the night would not be complete for our intrepid photographer without her favourite from the debut album, Age of the Raven that hit in after the bombastic Eye Among the Blind. The band looked awestruck by the sheer worshiping chanting and that their songs were being sung back to them by the entire audience. At this stage the walls were bleeding with sweat so the respite of Dying Embers of Life to cool down the room was needed, the lighters were out and it was stunning to hear a hundred voices singing the ballad of Raven Age. Needless to say Michael was humbled by such a response; George was like a Cheshire cat for the most part, grinning away at the response to their set and they were really feeding off it. 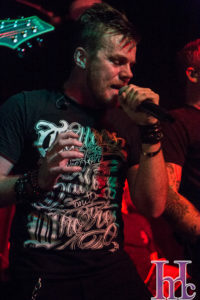 We were nearing the dying embers of the night when Trapped within the Shadows pummelled the room with shredding riffs and thunderous percussion; the vocals were still silky smooth, without a single note out-of-place, yet it was the introduction of My Revenge that showed off Tony’s talents to its fullest. 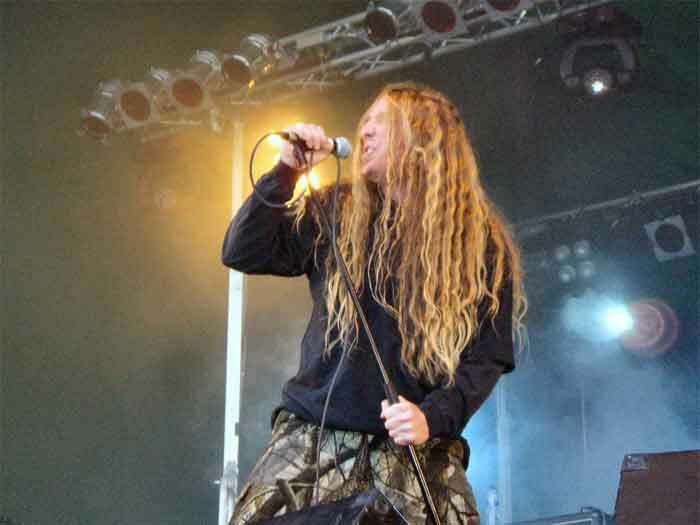 Tony gave Raven Age a new edge, his impressive death growls that are synonymous to the track were like the roar of the Balrog from Lord of the Rings and just as awe-inspiring as the beast itself when he came on to the big screen. The ferocity of the track made the room bounce, the crowd were like a rabble of goblins, excited and in fear all at the same time; well is all ended with the impeccable Angel in Disgrace to a rapturous roar of pleasure. The room was a sea of bodies undulating to the rhythm of the riffs, slaughtering their necks as the punching chords and percussion’s rang out; it was a dream of an end to the night and to make it all the more pleasurable was how welcoming the bands were, mixing with the crowd, happy to sign anything and anyone. This was the fourth time seeing Raven Age and we thought they were good before, but tonight was something special. What a night! 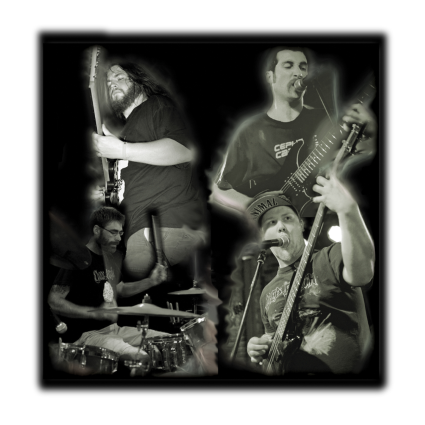 Check out In Search for Sun on Facebook. 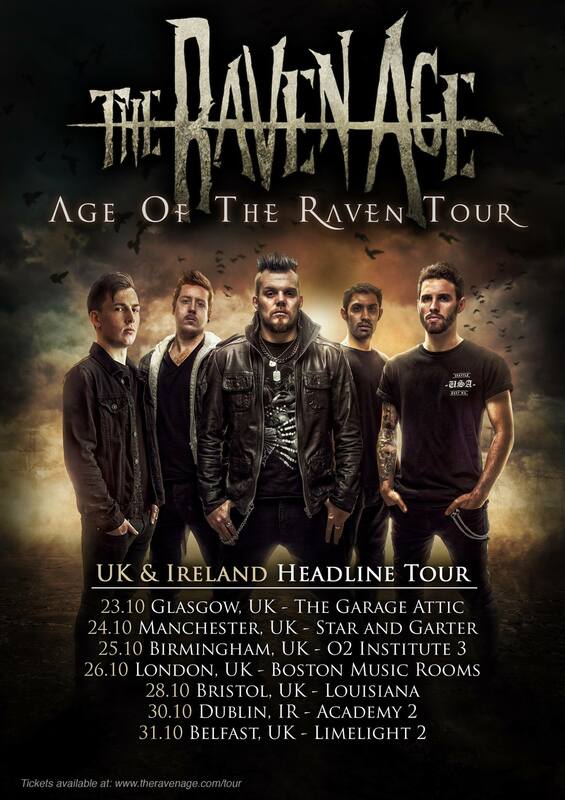 Check out The Raven Age on Facebook. 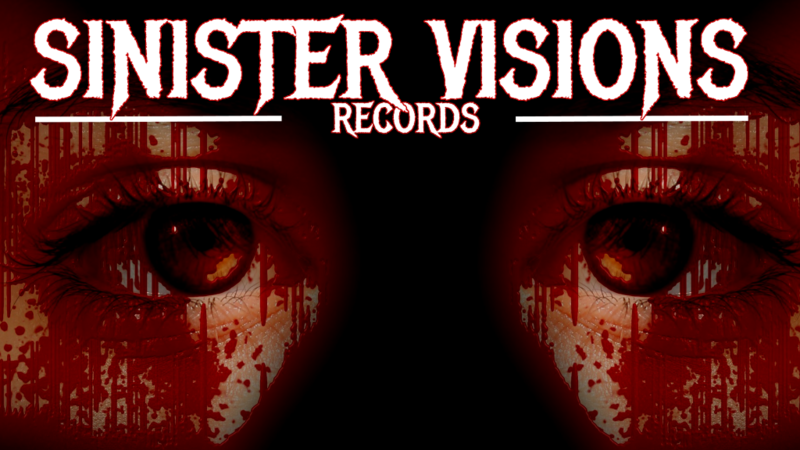 Sinister Visions Records – A new metal record label with a new business model!